One specific program it’s especially helpful with is the Whole30. I’ve noticed (based on your comments on this blog and social media) that a lot of you have either done the Whole 30 program, are currently on it, or have done it and continue to eat that way based on the positive effects it had on your body and mind! I’ve never done the Whole 30 program before. I’ve always been curious, and now, after seeing this gorgeous book, I’m looking forward to trying it! Plus, I always love to experience changes in my diet to see how it effects my body. I think that’s a smart way to find what works for you, especially at different stages in your life, since, depending on your age and period of your life, your dietary needs are different. For example, if you sprain your ankle and you’re sedentary for a few months, you don’t necessarily need loads of carbohydrates to fuel you. However, if you’re, say, training for a Crossfit competition, you’ll need to take in some healthy carbs and more protein than usual. Right now, I’m in wedding mode and I’m launching the Inspiralizer, so I don’t have the mental bandwidth to take on a program like Whole 30. It’s just not the right time for me, I need more flexibility right now. However, when I return from my honeymoon, I look forward to giving it a try! This book isn’t necessarily a cookbook – well, it is because it has plenty of recipes, but it’s more of a total guide to the Whole 30 program, with so much inspirational information. I’ve been reading through it and I’m learning new nutritional principles everyday. Melissa and Dallas Hartwig put together a complete transformational book, and I really recommend it. This romesco sauce (which I’ve actually never attempted before!) 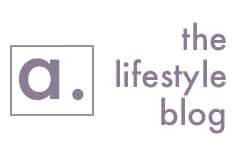 is absolutely addictive – in a totally healthy way! The flavors from the paprika and almonds are a killer combination and the consistency is wonderful. This recipe is definitely going to be part of my rotation – AND, it’s easy and quick (right up our alleys, right?) 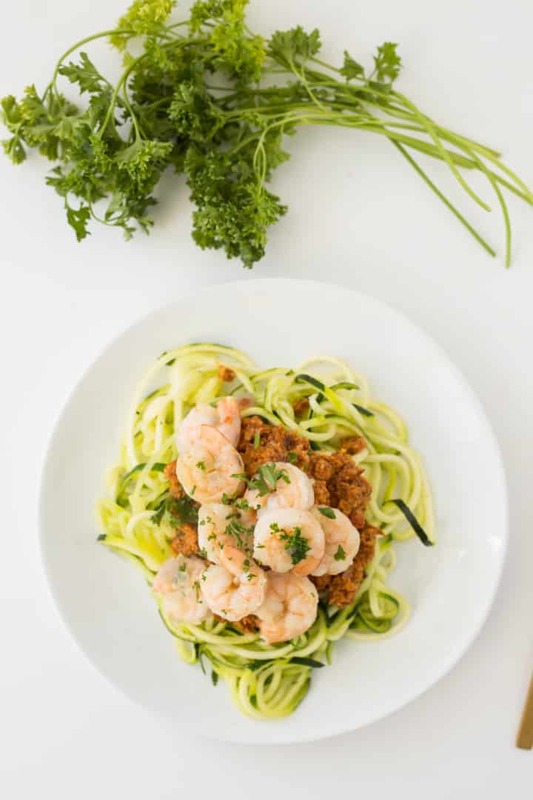 The zucchini noodles are perfect for the light shrimp and the romesco sauce is chunky enough to not cause a soupy bowl of zucchini noodles, like we all dread. I’ve made a few tweaks to the recipe, since the recipe is written for a julienne peeler. I’ve also adjusted the portions slightly – but that’s the beauty in this recipe and all the recipes in this cookbook, they’re totally versatile. NOW, if you’d like to enter the giveaway for this cookbook, you can do so by joining the Inspiralized newsletter! If you’re already subscribed, you’re automatically entered to win! I will be selecting a random winner on Friday at 5pm EST! 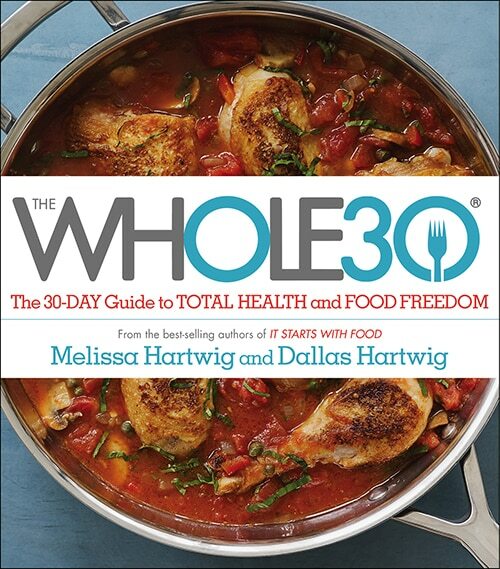 Thank you to the Whole30 team for producing such an inspiring book and for offering this giveaway for you all! "From The Whole30" or "From The Whole30: The 30-Day Guide to Total Health and Food Freedom." MELT the olive oil for the romesco sauce in a large skillet over medium-high heat. When the fat is hot, add the almonds and toast for 3 minutes, stirring often. Add the onion and cook, stirring, for 2 minutes. Add the garlic and cook until aromatic, about 1 minute. Add the chili powder and paprika and cook until the flavors open up, about 30 seconds. Finally, add the tomatoes, mix into the ingredients, and cook, stirring to bring up the tasty bits from the bottom of the pan, until the tomatoes are warmed through, about 2 minutes. Transfer the sauce mixture to a food processor. Add the rest of the ingredients and blend on low speed until the sauce is smooth, then set aside. MELT the olive oil in a large skillet over medium heat, swirling to coat the bottom of the pan. When the oil is hot, add the onion and cook, stirring, until translucent, about 2 minutes. Stir in the garlic and cook until aromatic, about 1 minute. Add the shrimp, toss to coat with the onion and garlic, and cook stirring, for 2 minutes. Add 1/4 cup water to the skillet and cover with a lid. Cook until the shrimp form the shape of a “C,” 4 to 6 minutes. Transfer to a serving bowl (draining any remaining water), and season with the salt and pepper. AFTER you add the water and cover the shrimp, place a large skillet over medium-high heat. Once heated, add in the zucchini noodles and toss for about 5 minutes or until softened or cooked to your preference. Divide into plates. Top with romesco sauce. 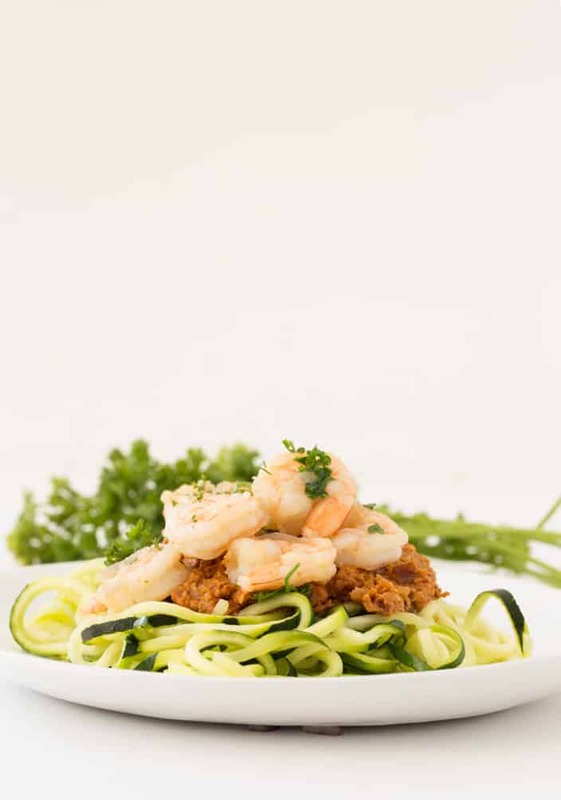 SPRINKLE the shrimp with the parsley, toss, and spoon over the dressed zucchini noodles and serve. I don't have a spiralizer yet, but I'm dying to get one now!! I'm dying for your new spiralizer. I known it would change how we eat if I won it! Zucchini noodles are AMAZING! We have them a couple days a week for dinner. 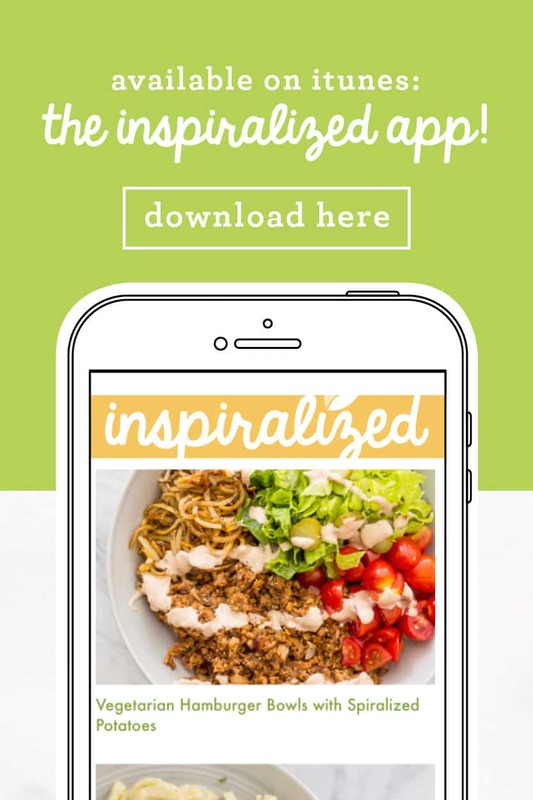 I love my spiralizer and your newsletter!! However, just a quick note...the link to the cookbook drawing appears to be 'broken'...it didn't work, this morning. Have a grrr8 day! Looks tasty! Loving making spiral used dishes for a healthy alternative to pasta! This recipe sounds (and looks) delicious! Not so sure about the almonds, but will certainly try it before I judge it :) One of my goals for 2015 is to complete a Whole 30 program. Just need to round up some recipes so thank you for this one! I can't wait to start using my inspiralizer! I've really found that the spiralizer makes it easy to enjoy foods that I normally would not eat (like pasta) that are too heavy for me. It's been an easy and amazing way to incorporate more veggies into my diet, and I'm so grateful for it! 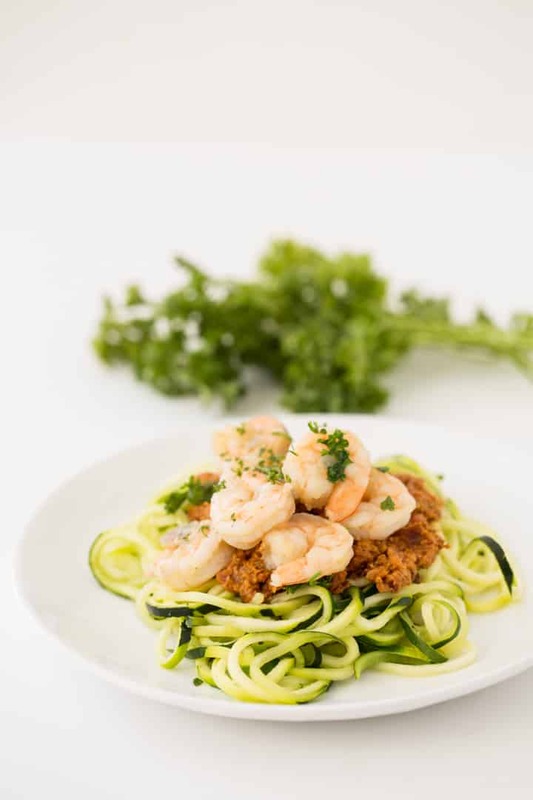 My spiralizer has offered me a healthy alternative for my favorite dishes. I don't know what I'd do without it! Love my Spiralizer.....I have spread the word and everyone I have told about it loves it as well. I love being able to be so creative with vegetables AND make eating healthier! I wish i had a spiralizer for all the benefits. I dont really eat pasta, and this would make it so much healthier for me and i cannot wait to try new receipes with it ! I like the spiralizer because it makes cooking prep fun! I'm a little clumsy so there's always this looming fear of cutting myself. Sprializing minimizes that fear by about 85%. Oh., and as far as how has the Inspiralizer changed my life - the answer is, in so many ways! I now spiralize vegetables at least 3 times. It has helped me to stop craving pasta and other carbohydrates, and now when I eat traditional pasta I actually find that it tastes BORING. 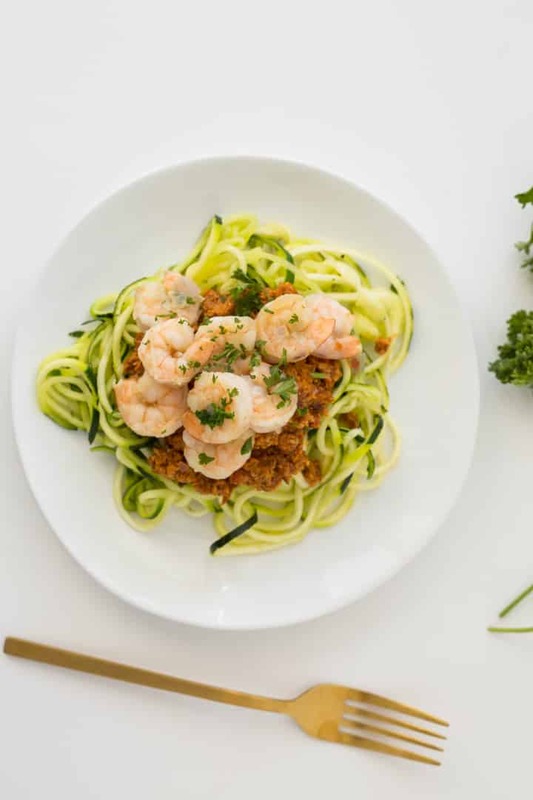 So yes, the spiralizer has definitely set me on the track towards healthier living! I love my spiralizer, I use it at least once a week. I LOVE these recipes! I cook one of them at least 3 times a week!! So much better than Pasta!! Spiralizing definitely adds variety and ease to my (eating) life. I've never used a spiralizer but I need one, Now! This looks so delicious and healthy. I have the Amazon spiralizer and love it but can only imagine that yours would be very well designed! Hope to try it out. I just got my Inspiralized cookbook and can't wait to start making healthier meals for my family! Love the giveaway! The spiralizer has introduced me to so many new veggies! I'm a college student and the spiralizer has allowed me to make quick, simple, and healthy meals! A lot of college students around me think that eating healthy takes too much time or preparation, but the spiralizer continues to prove them wrong. Absolutely love it and all your delicious recipes! My spiralizer has inspired me to try a variety of vegetables that I wouldn't have thought of eating before. And my food looks so much prettier! I haven't been able to spiralize yet but I want to start. I have a young baby on solids now and it would be fun easy way to help her with veggies in the future. Plus, a quick way to make meals for the family. Following Ali for the past year has totally changed my view on health and goals. She has made so many delicious meals and inspired me to cook for fun, and she's transformed personally through slow and steady good habits! Thanks for being such a great example for all of us, Ali! I also love Whole30, and actually first started following Ali when I completed my first Whole 30 last year. Starting my second one today! My life has changed completely since getting a spiralizer! I never would have eaten zucchini before spiralizing it and now I eat it every week! It also helped me make my paleo lifestyle so much more versatile and fun. I love experimenting with new veggies and flavors and food pairings and when I get bored, i just try something new. Spiralizing has totally changed my food game in a great way! I am lactose intolerant, and learning about spiralizing has given me so many easy ways to bring back italian/pasta-type dishes into my diet. I love it! I don't have one yet, but I can't wait to get one! It will be a fantastic way to add more and more veggies to our meals! My life has changed for the better because I'm eating even more veggies, in better combos! I'm always looking for ways to maximize nutrition and eat healthy and the spiralizer has expanded my horizon by giving me new and delicious ways to prepare fruits and veggies. Using spiralized veggies is so versatile and I love that I can use them in place of pasta or rice in any recipe- plus my husband loves them too! Healthy food doesn't have to be boring or bland, it can be spiralized! I use my spiralizer all the time! Right now I am loving sweet potato noodles and beet noodles! I don't spiralize yet but I can't wait to start! Your so awesome. My life has completely changed since I discovered spiralising!! There are so many dishes I can now eat thanks to this little gadget... spiralised paella 'rice' and zucchini 'pasta' are two of my faves - I can't wait to try this recipe it looks brilliant! I don't have a spiralizer yet but I do love my julienne peeler, it is a fun way to use more veggies in a meal and make meals look fancy! using my spiralizer helps me eat more veggies!! LOVE IT! 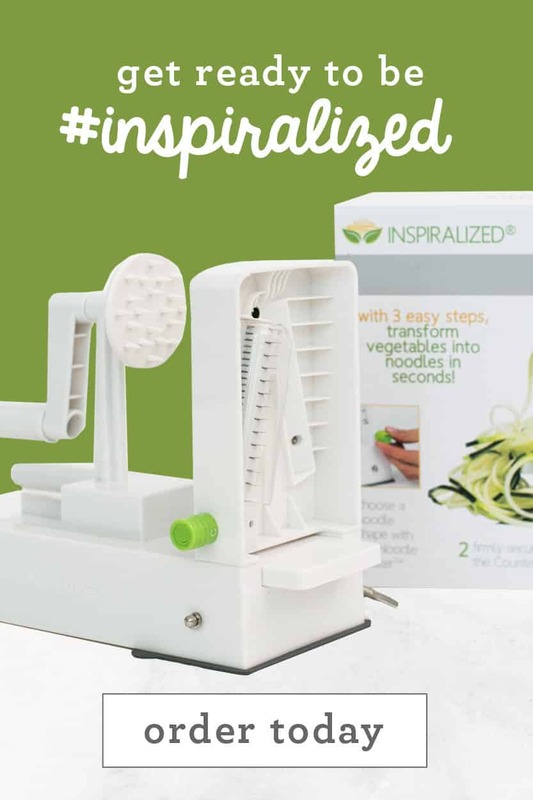 I LOVE using my spiralizer to inspire creativity in the kitchen + eat fresh veggies. YUM! I do not have one yet but cannot wait to try it out! I don't have one yet but I have your cookbook! Now I just the inspiralizer to make the meals! I've not had my spiralizer that long, but I really like it! It definitely has helped me fit more vegetables into my diet and even my husband likes the zucchini noodles! Noodling all of the veggies!! It gives variety to eating vegetables. Makes eating them more fun (and I think more delicious as well). Great way to get people who don't like to eat vegetables to eat vegetables as well! Spiralizing has meant more vegetables and exciting dinner options! Creating salads has been easier and integrating healthy choices has been possible! Spiralizers make it so easy to enjoy healthy foods in creative ways! Great recipe as always. I used my padermo spiralizer so much it broke !! :( I rarely eat zucchini but I love my zoodles!! I have been eating more veggies then ever! Would love to win yours, the improvements are amazing!!! I did not like zucchini until I made zoodles! Definately spiralized over the weekend for Easter with the family! Looking forward to trying this recipe! I have two very young daughters and want to be an example for them. I am so eager to try the inspiralizer so that I can fun and nutritious meals for them and me. I just tried spiralized veggies for the first time last week. Wonderful! I can't wait to make some recipes myself. I'm just learning how to use the spiralizer and it's been fun! It's a nice change of pace. I need to get one of these, don't I? This would seriously change my life. It hasn't changed my life yet since I've only ever used it for zucchini, but I have a feeling it is about to now that I'm signed up for your newsletter! Spiralizing makes trying new veggies much more fun! My kids love it too which is always a bonus when it comes to eatting their vegetables. 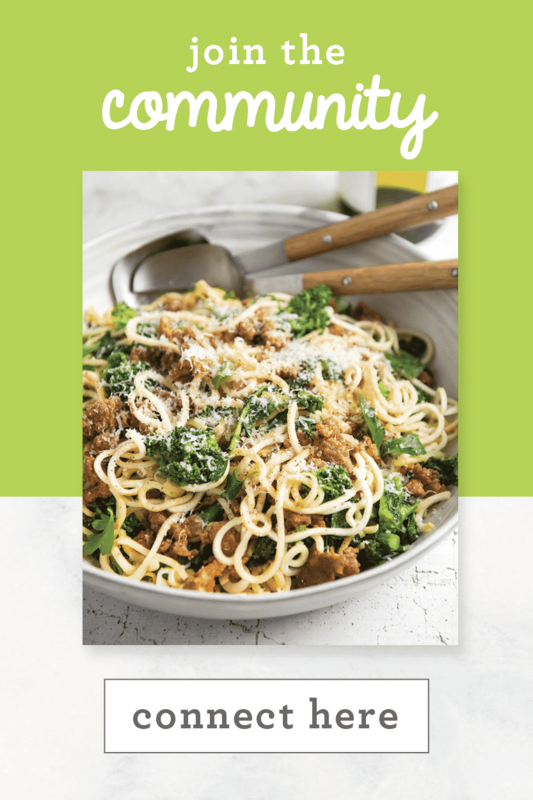 The Spiralizer & your recipes have looked so amazing to me! I'm always looking for new ways to actually eat more veggies & you make it look so easy & delicious!!! 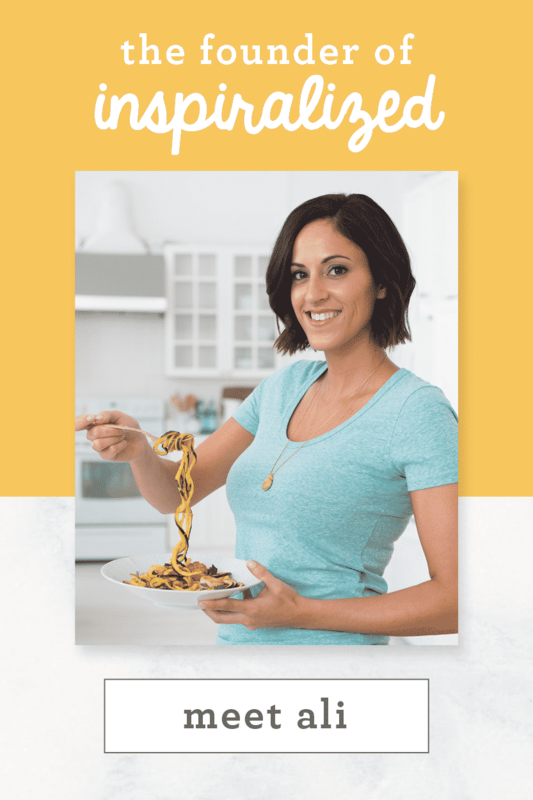 Girl, I am dying to try your Spiralizer! I am obsessed with your book! Your spiraled buns are AMAZING!!!! It's so awesome to feel free to eat tasty food. You don't miss a thing about pasta when you have this tool! Well, I've only used a hand-held spiralizer...it worked great for cucumbers, but broke when I tried to use it with a sweet potato. I was so bummed! 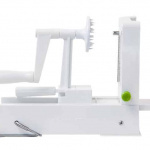 I've got a real spiralizer on my list of kitchen gadgets, so winning yours would be amazing! This sounds so good! Beautiful presentation! I originally bought the Paderno Spiralizer and it was great. After raving about it, my grandma asked me to order her one. I saw a knock off brand on Groupon that I ordered for myself because it was red and would match my kitchen. Gave grandma the Paderno. The knock off is horrible and I hate it. I hardly use it anymore since the blade isn't sharp enough and doesn't make a thorough cut. Would love to try yours it sounds great, love your recipes and website. I feel so much better about my health since getting inspiralized! I am still working out the kinks but gosh darn it zoodles are just too good. Love that i can feel good about what I am eating. Thank you for all the amazing recipes! 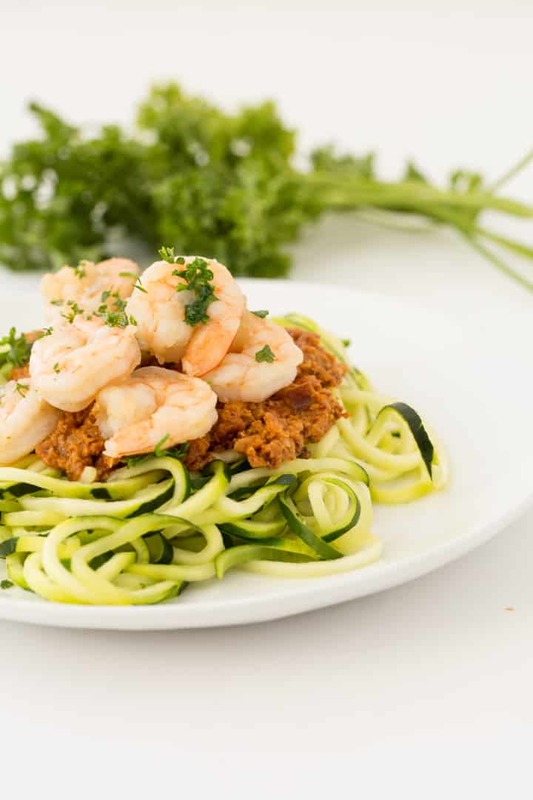 The spiralizer has certainly made incorporating more vegetables into our diets quite easy! i bought a semi-cheap spiralizer from an estate sale held locally. even in all it's wobbly glory i still almost wept when i spiraled my first zucchini. reminiscent of my first raw/vegan meal from an amazing place called Leafy Greens, i thought how incredible the possibilities are for new food options and brilliant recipes! my excitement is palpable. with what i've tried so far every vegetable tastes as it should, coming through and melding with every other delicious ingredient. 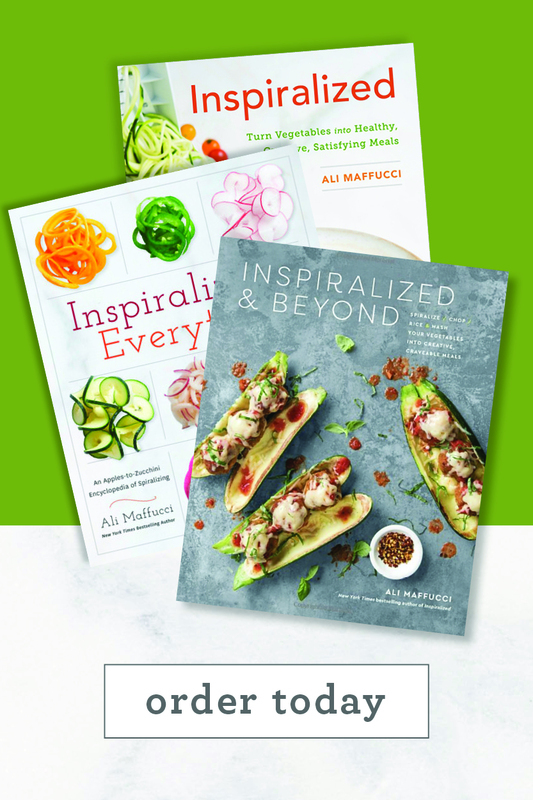 i can't wait to continue my exploration in inspiralizing my dishes! Looks like a great way to eat more vegetables. I need to get one of these. Spiralizing is just the greatest thing! I don't know how I lived without it! I keep my spiralizer right there on the counter, near the sink, because I use it ALL. THE. TIME.! Thank you Ali, for all your great ideas! 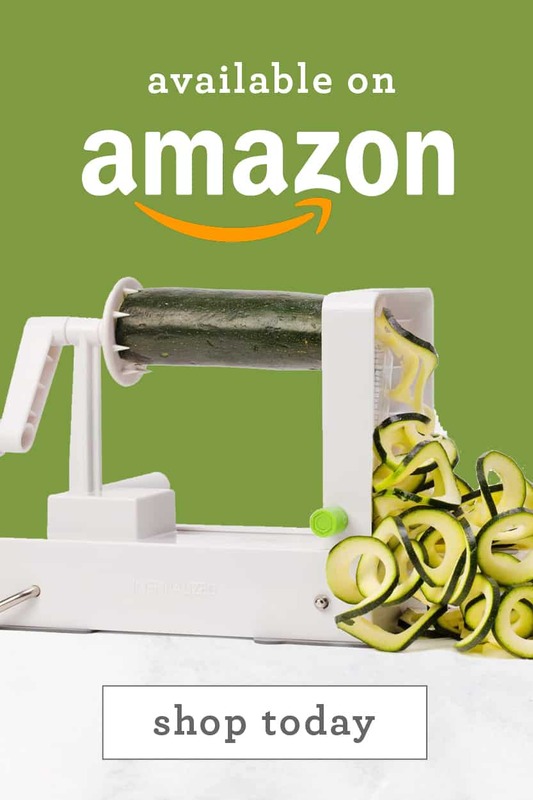 I ordered your new spiralizer and I can't wait to get it! This will be the 6th spiralizer I have purchased, (not counting julienne peelers). They make the best gifts! My repertoire of vegetables has increased since visiting this site. I see recipes that make me want to try vegetables that I've never had before. Oh my goodness. This was definitely one of the best recipes from inspiralized I have ever made! Took forever it felt like but it was worth it. I didn't have chili powder and used red pepper powder instead. It was super spicy but I loved it! Can't recommend this enough! I was surprised how much I liked the taste of everything I have made with my Spiralizer. I don't feel well when eating pasta (carbs) so having the Zoodles etc., is great. It is so much fun to spiralize the vegetables instead of the same old way of eating them! Oh my goodness...literally. This recipe was delicious and easy to make. Both my husband and the kids asked for seconds. I will definitely be making this recipe again. The garlic shrimp with romesco sauce was the first recipe I've tried on this site. My boyfriend and I loved it! It was fresh, interesting with its varying textures and absolutely delicious. I'm just getting started with my spiralizer and am so excited to try more recipes on your site. Thank you. My friend and I are on Dr Mark Hyman's 10 Day Detox plan and have given up wheat, dairy, caffeine, sugar and alcohol. This recipe fit perfectly and didn't feel like we gave up anything!!! It was delicious! We were a little put off by the almonds in the sauce (although I knew it was normal in a sauce like this) but we're very pleasantly surprised at hoe good it was. We did add some red pepper flakes because we like a little spice but kept everything else the same. We spiralize at least once a week! I tried and tried and cant find the tomatoes in the recipe...canned or fresh? how much? Look under the ingredients for the sauce, it says 2 tomatoes, seeded and chopped. The romesco sauce is wonderful. Thank you for sharing this recipe! Made it with a can of diced tomatoes, since that's what we had on hand, and doubled everything else (except for the salt). It's on the chunkier side (as pictured), so if you prefer a thinner consistency, blend on high and slowly add EVOO to reach desired consistency. This was our first spiralized recipe and my family loved it! The only thing I might suggest is to shorten the cooking time for the shrimp - ours were very tough. I loved the Romesco sauce and the paprika and chile powder were perfect! Delicious meal - thanks! This is a great recipe. Just wondering where the 12 grams of sugar per serving are hiding? None of the ingredients seem sweet. I am eating low carb and the almonds stretch that a bit, but sugar? ?